Did you know that you can add both Share and +1 buttons to your Google+ marketing page? 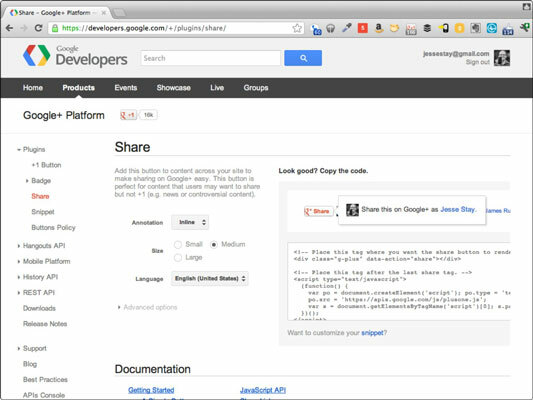 Google+ provides a Share button for websites that want a little extra prompt to get users sharing content. Some people like the +1 button in place of the Share button because it gives the user the opportunity to share as well, but if the +1 button isn’t enough, you’ll want to consider a Share button. The easiest and first thing you should do to your website when you create your Google+ presence is add +1 buttons to every piece of content or product you feature. On every landing page where you want better search engine rankings, you should have a +1 button. It shows visitors that there are more people than just them visiting and endorsing the content where the +1 button is placed. Seeing a number greater than 0 shows your visitors that you have an audience and that people are interested in your products. The effect still happens if the number of +1s is 0: That 0 tempts a visitor to be the first one to click that +1. It allows visitors to both endorse (through the +1) and share content from your website with only a couple of clicks. Every time someone clicks the +1 button, it also prompts the visitor to share that page to friends on Google+. The combination of button and prompt makes it easy for people to share content on your website — and to make it count. It displays other content on your website that others have endorsed, showing off your most popular content amongst a user’s friends on Google+. When visitors mouse over the unclicked +1 button, they see a list of other pages on your website that have been endorsed by others. This handy tidbit of info encourages more traffic to your website and keeps visitors around longer. It improves your search ranking on Google.com. Every endorsement your site or app gets via a +1 button improves your ranking on Google.com search results. Even better, when a friend has endorsed an article, that friend’s +1’d articles on your website will rank higher for everyone who has friended the person. No matter what, your ranking is going to go up. The Share button puts the word share a little more prominently on your content or products that you want shared on Google+. This way, if users don’t know much about the +1 button but still want to share what they’ve found, they can still have that option — in an easy-to-find way. Make sure you A/B test having the Share button in place or not having it — does the button really improve shares, or is there no difference? No matter what, you’ll still want to have the +1 button in place because the +1s improve search. However, having the Share button might be a good way to improve the number of shares for a given page on your website.